Like many people, I have backed projects on Kickstarter. But I was curious about what it would be like to launch my own campaign for a product I created. It’s called the THINKERS Notebook and it’s currently running on Kickstarter. And while there are numerous articles about how to run a successful campaign, none of them truly prepare you for the reality of the experience. So I want to share a few things I wish I had known, or at least done sooner, before I clicked the Launch button. It takes money to raise money. You’ll have a lot of expenses (both incidental and direct) whenever you sell anything online. This is especially true when it comes to Kickstarter. Plus many more that you’ve probably never considered. I know I hadn’t! Many of these costs are before you hire a crowdfunding agency or a professional to help boost your campaign. So, before you even consider launching a Kickstarter campaign, develop a budget for everything you foresee needing before and during the campaign. As a rule of thumb, I would expect to spend 40 percent of your budget prior to the campaign and 60 percent as it is running. Why so much as the campaign is running? Ads, lots and lots of ads — primarily on Facebook and other social media channels. My advice is to get a credit or debit card that has a balance sufficient to fund your budget. If you have the cash, a debit card is great, especially if you have a separate bank account tied to it. Alternatively, you can find a zero percent interest introductory offer from a credit card company, one that gives you six months to pay back. To be clear: I am not advocating you go into debt. But having a debit or credit card that caps your spending will help you stay within your budget. And almost every service you will use takes a credit or debit card. Be smart with your money: Set limits, allocate your spending, and be prepared for those unanticipated expenses. The amount of content you need to generate for your Kickstarter campaign can be staggering. And just like all other forms of online marketing, headlines and calls-to-action matter. Are you already a good writer? Great, you will need to hire an editor. Not comfortable writing direct-response copy? Then you will absolutely need someone who is. 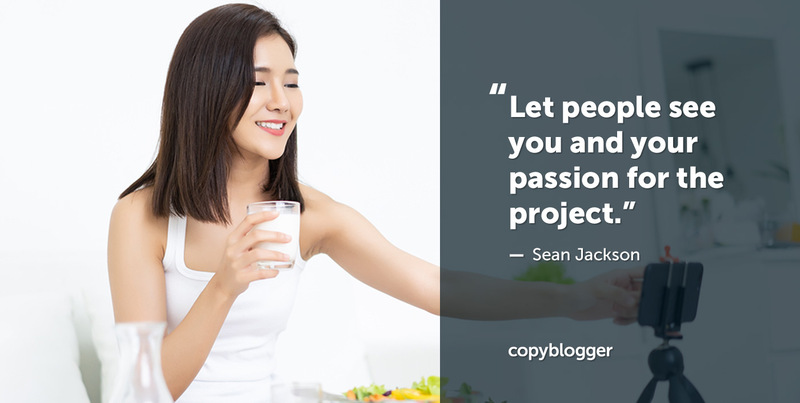 Luckily, Copyblogger has a network of Certified Content Marketers. Take advantage of their services. For me, having a skilled writer is crucial for both before and during a campaign. While I can write copy, having someone edit my work and, more importantly, collaborate on new content ideas makes the entire process easier. As you work on your budget, make sure to include the cost of a skilled writer. The success, or failure, of your campaign may rest in this one decision. So, find someone who is skilled in writing copy that inspires people to act. Most successful Kickstarter campaigns have compelling videos on their landing pages. But creating a compelling video is not easy. It all starts with a great script — another reason why you need a skilled writer. Then there is the production of the video and the countless hours of editing. Online video ads can be powerful. However, the challenge is that you need to tailor your ads for different types of audiences on different mediums. Also, you will probably want to host live video events using Kickstarter or Facebook Live. And the really scary part is: you need to be in those videos! A major reason why people back Kickstarter campaigns is to support the person behind the campaign. So, it’s essential that you let people see you and get to know you and your passion for the project. If there’s one thing I wish I had known before launching the campaign, it’s the amount of video I would need to produce. There are several tips I highly recommend as you build your video strategy. Consider buying a high-quality lavalier microphone that works with your phone. In addition, buy a professional video app for your phone. It makes the process easier. It doesn’t take a lot to produce a solid video, and having a way to hold your camera steady along with good lighting helps. Take the time to find a location where you can quickly set up your lights and camera, preferably in a spot where you can leave your equipment — so you have a dedicated place to create ad hoc videos. There are a lot of video editing options available, but not all of them are right for you. Take advantage of the free trials they provide to find the one you are most comfortable using for edits. While having a teleprompter is convenient, you’ll improve your on-screen performance if you write down your words and memorize them. Even if you have a writer crafting a script, take the time to write out the copy. Doing so will help you retain the script and speak it in a tone that is authentic to you. Don’t try to be something you are not, but do try to be the best presentation of yourself. I keep a black shirt and coat handy so that I can quickly change out of whatever t-shirt or sweater I’m wearing. And the nice thing about a black outfit is, it helps keep the focus on your face and hides any wires from your microphone. Videos can be effective parts of your online marketing strategy, and the more prepared and comfortable you act on-screen, the easier it will be to produce them. Social proof is an important part of any product launch, especially if you have a new product like the THINKERS Notebook. I was very fortunate to have people like Brian Clark, Sonia Simone, Chris Brogan, Bryan Eisenberg, Chris Lema, and many others support my campaign online. But what if you don’t have the same type of influencer connections? Then you need to start building them many months before you launch your campaign. And the best way to connect with them is simple: Engage them with something meaningful. It starts with becoming an advocate for their efforts, continuously. That means you frequently promote their work online through insightful comments and sharing. But beyond active engagement, you need to build relationships with them. Your network can help here. See if anyone you know can make personal introductions, and while you pursue new connections, be prepared to provide all of them with samples of your project. You should also have digital assets they can see and use, if they want to help promote your campaign. Influencer outreach is hard, but not impossible. The more you support your selected influencers, the better the chances of them supporting you. Launching any product online takes a lot of time. Most Kickstarter campaigns run for 30 days, but that doesn’t include the months of prep work you have to do, or the period of time after the campaign it will take to fulfill the rewards you’re offering. And while there are ebbs and flows of activity prior to and after a campaign, you will be constantly busy while your campaign is running (like I am right now). Yes, they are important to you, but they may not be priorities during this period. Let them know about the work that will be taking up your time. Set time to exercise on a regular basis. Schedule your week using your personal calendar, setting aside times to respond to requests or focus on your work without distractions. Even if you meet your goal, you will need to allocate even more time to growing your backers. And if you don’t meet your goal, then you will spend even more time attracting backers. Basically, you will need to schedule your life as best you can, knowing that at a moment’s notice your plans might change due to the demands of your audience and the short period of time you have to conduct a successful campaign. I love using project management software. The problem is that these programs are too slow when I need to quickly add or adjust the numerous items I have to juggle. I have a constantly evolving checklist of items with me at all times. Sure, I could use something like Trello, but most of the changes or additions to the checklist are done when I’m not sitting in front of a computer. These changes come from conversations I’m having or from things I think about when I’m not at my desk. And no, using a phone note app is not easier. It takes too long to type things out. There’s no substitute for having a pen and notebook handy at all times, as I think about all of the things I need to accomplish to make my campaign successful. It makes it easy to capture your ideas on paper with plenty of space to sketch out ideas and create notes and checklists. And better still, it comes with a simple-to-use app that allows you to store your ideas online and share them with others. Running a crowdfunding campaign on Kickstarter is not for everyone, or for every product. While I don’t know where my Kickstarter journey will lead, I can say that the experience has been enlightening. And I’m glad I got to share a few of the lessons I’ve learned while neck-deep in doing everything I can to make this Kickstarter launch a success. Hey, if nothing else, you get a chance to see me on-screen. I believe that the more generous you are to others, the better your life will be. The links in this post to THINKERS Notebook are affiliate links for Copyblogger. Even though I’m a co-founder at the company, I owe it to my partners to support their help along my road to reach my goals. What a great article, Sean. Nicely detailed. In line with your #4 – my #1 would have been: Have an existing client/fan base that has already expressed an interest. I’ve been on both winning and losing campaign teams and have learned that crowdfunding is an extension (and product) of networking and community building.